Carrie Phelps is a PhD student in the Healthcare Systems specialization in Saybrook’s School of Mind-Body Medicine. 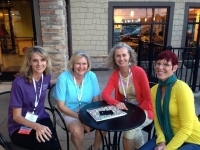 (Carrie Phelps is seen on the left above with colleagues at the National Wellness Conference). Carrie has been attending and speaking at the National Wellness Conference for the past 16 years. This year’s Conference was especially rewarding for her as she presented with her friend, Saybrook colleague, and business partner Char Conlin. Char and Carrie conducted a breakout session called Contrary to Popular Practice: Building Wellness Programs for the 21st Century to a packed house. The presentation was based on the information revealed in Carrie’s and Char’s pilot study, which focused on the examination of the characteristics and attributes of a traditional health promotion program within an organizational system (in order to gain a deeper understanding of what works and what doesn’t work within traditional health promotion programming). In addition to the breakout session, Carrie co-facilitated the conference 3-day Coaching Academy, which included presentations and coaching demonstrations by representatives from the International Coaching Federation (ICF). The coaching academy was designed to introduce leading-edge information on wellness coaching and to provide coaching demonstrations and networking opportunities for coaches from various backgrounds. Within the coaching academy, Carrie presented on the topic of Energizing Emotion: Mind-Body Coaching Skills That Help Participants Celebrate and Transform Emotion. This session engaged academy attendees in mind-body skills such as “soft belly” breathing, mindfulness meditation, and “shaking and dancing.” Participants learned about the profound connection between emotion, cognition, perception, and performance. Many of the coaching academy participants expressed enthusiasm for the insights they gained on how emotions—energy in motion—can serve as a wonderful personal guidance system for both the coach and the client, and how mind-body skills can be an important and effective way to help coaching clients celebrate and transform emotion.